The book fair was held in the foyer of a shopping mall as well at one of the empty units. Books for adults (novels, romances, hardcovers, business, health, etc) are all in the empty unit whereas the foyer housed books for children. There weren’t really a lot of book at the time I went which was the 1st weekend. The only word I can use to describe my 1st visit was ‘boring’. For some reason, nothing interested me at all. I walked around having a look here and a peep there. The usual gang was there. I said hello to James Patterson, had a bit of chat with Dean Koontz. I didn’t say hi to Danielle Steele since I was not keen on what she has to offer. Some older folks like Lawrence Sanders whom I have not met for a long time was there too. So was David Baldacci. I saw John Grisham and Marian Keyes which was a surprised. I met some new folks but for some reasons, non of them appeal to me in such a way that I would want to bring them home with me (that sound a bit wrong). After that first visit, the 2nd visit took place a few days later. Again it was uneventful. I knew Face of Betrayal by Lis Weihl kinda hope I bring her back with me but I was not motivated. After half an hour of looking around, I left disappointed and empty handed. I was more determined on the 3rd visit – I told myself that I am not going home without purchasing something. The strategy would be to go through all the novels, one by one, picking out the ones that trigger even the slightest interest in me, drop them in the basket, move on and repeat the process and for the selected books to be sorted out again later. I did just that (what a long process!) and ended up with about 10 books and from there, I shortlisted these. Phew! I didn’t know shopping for books can be such hard work! 1. Part 2 of Lord of The Rings - The Two Towers by JRR Tolkien – I bought Part 3 during the same book fair last year. Perhaps I will buy Part 1 the following year? 2. 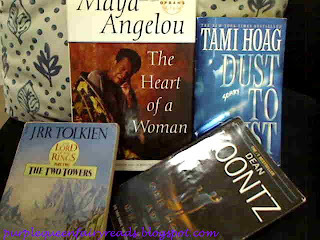 The Heart of A Woman by Maya Angelou – Oprah’s Book Club. Maya Angelou is Oprah Winfrey’s mentor and a woman of substance. I want to know what her heart says. 3. Dust to Dust by Tami Hoag – never read Tami. She was highly recommended by a friend so giving her a try. 4. One Door Away From Heaven by Dean Koontz – it’s been quite a while since I read a really captivating Dean Koontz. I hope this would be it. Today is the last day of the sales. Have you been yet?